Today was one of those good days when my employer fed me lunch on their dime. A guest speaker, Joshua Neufeld, the artist behind such graphic creations as The Influencing Machine: Brooke Gladstone on the Media or A.D.: New Orleans After the Deluge (Pantheon Graphic Library) , a graphic account of the aftermath of Hurricane Katrina, had given a lecture. We gave him a luncheon (and presumably a wad of money). As I sat down to the table, I found the usual fare, including glasses of water and tea. We’re swanky at JCCC! But then I saw the precise slice of dessert pictured here lurking just past my super-healthy grilled chicken salad. 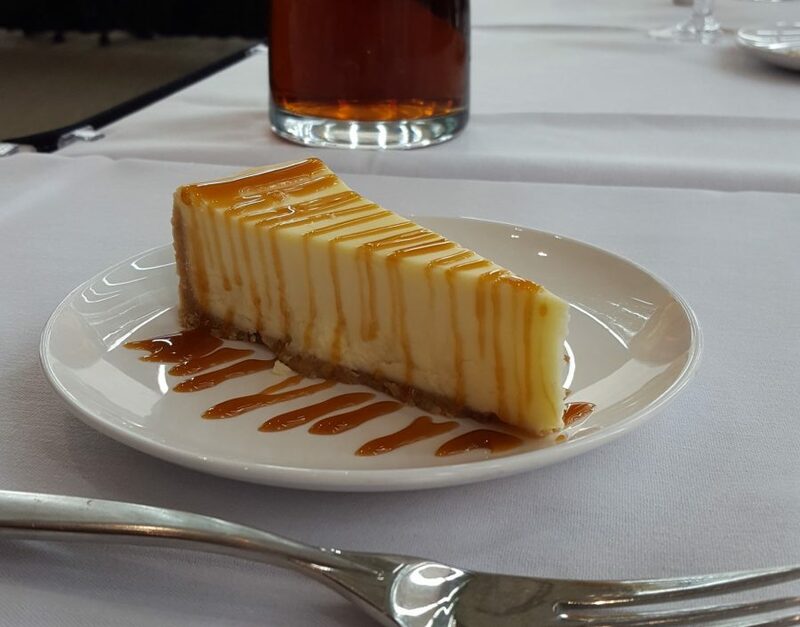 Not only were they tempting me with cheesecake, but they’d drizzled caramel or somesuch all over it. I knew that, given my October Resolve to control my eating, I could not indulge in this delicacy. It would be colossally hard! That’s what I told Penny when I got home. “It was hard.” Then I thought about it for a moment and realized that not eating that marvelous confection really had not been that hard. I looked at it. I saw Beth to my left eat about half of hers. Maureen to my right ate most if not all of hers. Mine never moved. That’s when I found myself reminded that resisting temptation is not the incredibly difficult thing that we make it out to be. Temptation came my way not by the hand of Satan but my the hand of JCCC Food Service. The desire for it might have been nudged forward by Satan, but for me to truly be tempted, to find it hard, I would have to turn that desire over in my mind. James 1:13-15 describes the process by which temptation develops. It starts with an idea, but it only moves from desire to sin to death when I allow myself to be “drawn away and enticed by [my] own evil desire.” It’s not the cheesecake’s desire. It’s not Satan’s desire. It wasn’t the desire of Beth or Maureen. It was mine. All I had to do to win the moment was not to feed–either literally or figuratively–that desire.